Preston Calvert will be a busy man this the weekend at the Circuit of the Americas as he will race in three Pirelli World Challenge SprintX events in the No. 77 Calvert Dynamics Porsche 911 GT3 R, a well as the double-header Pirelli GT3 Cup Trophy USA race in the No. 71 Calvert Dynamics Porsche GT3 Cup car with Competition Motorsports. The Pirelli GT3 Cup Trophy USA is an all-Porsche series that stages races mostly on the Western half of the country, with a field of racers who generally have more experience than the runners in PCA competition but features a more collegial environment than the often cut-throat competition in IMSA’s Porsche GT3 Cup series. 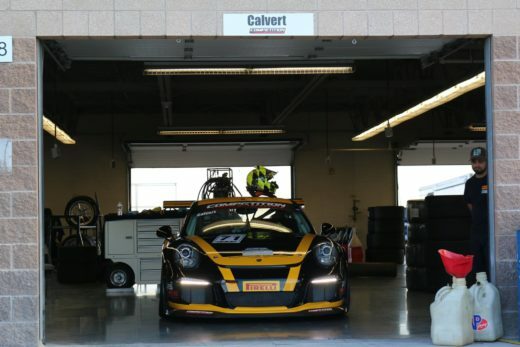 Preston Calvert made his Pirelli GT3 Cup Trophy USA debut at Utah Motorsports Campus, twice finishing 2nd in the Diamond Masters class. “The racing was great and I had a really great time out there,” said Calvert. “I raced door to door through turns three and four, and it worked out well with the drivers giving each other the room needed. The COTA race will give Calvert the chance to once again switch back and forth to gain the most possible track time on offer during the Labor Day weekend event. “It felt really good (to switchback and forth between the cars),” said Calvert. “The cars are very different but the R, it accepts lots and lots of inputs, so you can drive the heck out of it! Calvert is relishing the opportunity to fight for the podium in two different championships once again this weekend, and figures he’s got strong competition no matter what paddock he is racing in. “There are some very fast guys in the GT3 Cup series the young guys at he pointy end here are plenty quick. Their times are better than some of the guys in the (Pirelli World Challenge) Sprint X Cup class by a second or so.